Special Order! : Must be cut and shipped from the Ohio factory. 2 day lead time. RoundFlex diameters of 3" - 12" UL Listed for wood, coal, oil, and non-condensing gas when installed according to the manufacturers instructions. 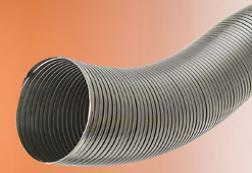 In 304-alloy RoundFlex we stock 3" - 10" in 25' coils. 5" - 12" diameters are also stocked in 5' lengths.